High-mix variable-volume production using all-purpose machine tools draws out the characteristics, which is necessary in order to enjoy the full benefits of such tools. In order to maximize the characteristics of all-purpose machine tools, OKS focuses on the utilization technologies of all-purpose machine tools than on the tools themselves. In the past, machining lines consisted of dedicated machine tools for mass production. Later, computerized all-purpose machine tools appeared. OKS believes that utilizing the technologies cultivated in the field of dedicated machine tools in general for computerized machine tools allows manufacturers to maximize the potential capability of such innovative tools, such as overwhelming machining speed and the capability to cope with a wide variety of processing materials. The accumulation of OKS research and development, since the earliest days of the all-purpose machine tool industry, lies at the foundation of its spirit of innovation. Utilization technology can expand simply through experience and accumulating technologies, information, and processes, along with the results of introducing applicable patterns. In the past 30 years, OKS developed over 3,000 types, including fixture systems for all of the 5Cs* of automotive engine parts. No other company in the world can match the outstanding achievements of OKS. As a pioneer in high-mix variable-volume production, which is a next-generation manufacturing standard, OKS will continue to use its uniquely improved utilization technology to achieve stable, flexible machining lines. OKS has provided technical assistance to the world’s leading dedicated machine tool manufacturers since our establishment. Our company succeeded in integrating the technology which won recognition from manufacturers as a package of all-purpose machine tools. Today, this is the basis of the utilization technology provided by OKS. Over 3,000 fixture systems for the all-purpose machine tool industry. The reason why OKS outperforms other companies in the fixture systems field, where customization is common, is our extensive experience with the development of over 3,000 kinds of fixtures. 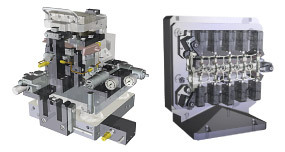 Stocking a wide variety of products and substantial experience in the field of machine tools and utilizing them appropriately in a variety of cases enables the rapid introduction of high-precision fixture systems. High-precision cutting of difficult-to-cut ultrathin materials. OKS developed a unique technology for the high-precision cutting of non-rigid, difficult-to-cut and delicate ultrathin materials with preload support. This technology has been introduced into several machining lines and used in the development of cutting-edge aircraft and space telescopes. Establishing a rational “soft line”. Machining lines can be roughly classified into two lines-“hard lines”for mass production in which the types of products that can be manufactured are fixed and “soft lines”which are suited for variable- volume production where a wide variety of products can be manufactured with flexibility. In light of these two types, OKS establishes“soft”machining lines which take into account investment and effect. Machining lines for mass production once imposed physical and mental strain on workers. Today, OKS is committed to realizing human-friendly production through commerce by working towards providing an environment where everyone can work safely and free from worry.